A small, keel-less boat, the coracle was specifically designed for operating in swiftly flowing streams. Evidence of coracles dates back to the early Bronze Age, though the first clear description of the craft does not appear in texts until 1188. Early coracles consisted of a basketwork frame covered in animal hide. Craft of this nature are mentioned in Welsh poetry of around 1440. Hide covers were supplanted by a material known as flannel, that in turn gave way (1794-1880) to the canvas or calico coverings that we see today. For the modern user (in an age of broken bottles and shopping trolleys to watch out for) WoodWorks coracles now come with the option of a super durable, UV stable, rot proof and puncture resistant PVC cover, which is available in a range of colours. My coracles are inspired by traditional Welsh styles but do not claim to be authentic historical replicas. The ‘Ironbridge’ and ‘Wye and Usk’ style having most influence on my designs. 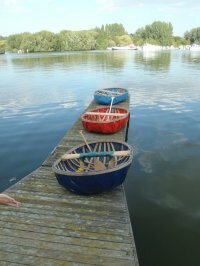 Coracles are easy to make even if you do not have any practical experience, and a two day workshop will leave you with a huge sense of satisfaction and a little boat to take home with you to show for your efforts! 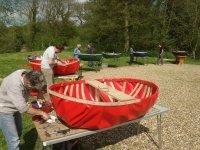 Weather permitting, there will be an opportunity to test your finished coracle at the end of the course, where you will be given guidance on safely entering your coracle and paddling instruction. Coracles can also be made to order in either the traditional or modern covers. Price on application.